Thank you to everyone who made the effort to enter the Herts Closed this year, which was held at Radlett Squash Club. We had 56 entries in all, it would have been more but unfortunately there were a few injured players who had to withdraw from the competition. I would like to thank Special Wear, our new sponsor for the tournament this year. They made an incredible contribution to the tournament that was appreciated by organisers and players alike. 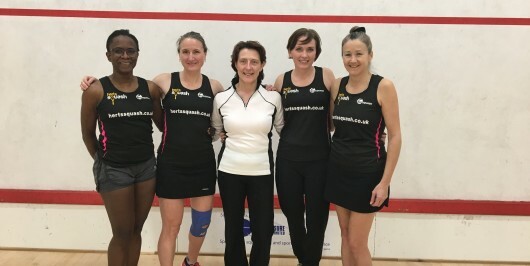 Radlett proved to be a great venue for the tournament and with four courts backing onto eachother, it gave spectators the chance to watch four matches at once! There were some epic matches in all categories of the competition. The most closely fought match was the Men’s C Final, with 13 year old Owen Ledger just beating Peter Iszatt 3-2. Owen and his twin brother Jay definitely faces to watch for the futture. We witnessed some breathtaking and entertaining squash over the weekend. The Men’s A Final being a fantastic finale to the weekend. Congratulations to all the winners and runners up.